Home NEWS Catholic Bishop Appeal for calm, asks politicians to tone down the tempers. Catholic Bishop Appeal for calm, asks politicians to tone down the tempers. A file picture of the judges of the Supreme Court. 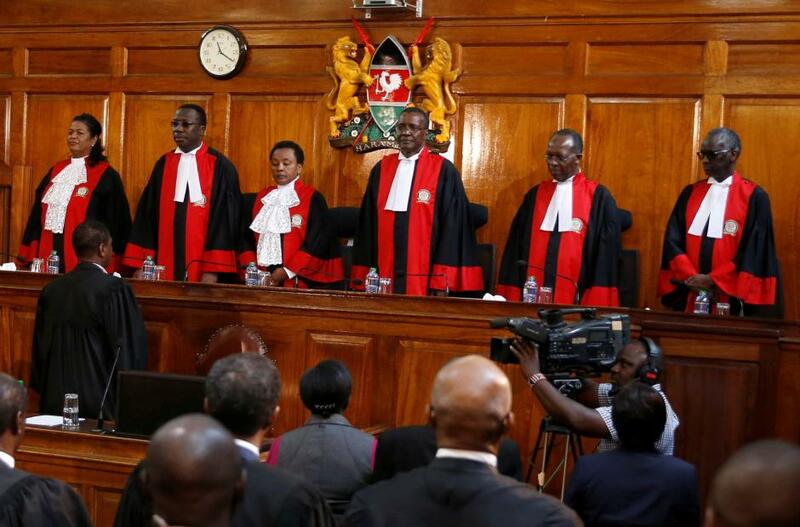 Last Friday, the court nullified the reelection of President Uhuru Kenyatta, plunging the country back to the campaign mood. Murang’a Diocese Catholic Bishop James Maria Wainaina has urged all Kenyans to respect the Supreme Court ruling that annulled the presidential results and maintain peace in the country. While speaking at Mugoiri Catholic church during the parish family day celebrations, the bishop also appealed to Kenyans across all political divide to exercise their democratic right to express their opinion through the ballot. Bishop Maria also called on politicians not to weigh their words as any form of provocation could ignite chaos in the country. These sentiments were echoed by Murang’a Women Rep. Sabina Wanjiru who appealed for calm as she asked politicians to tone down their utterances. Sabina encouraged all Jubilee Party supporters across the country to come out in their numbers and reaffirm President Uhuru Kenyatta as their leader during the scheduled presidential rerun. However, Kiharu MP Ndindi Nyoro rubbished the Supreme Court ruling terming it as political in favour of the NASA brigade. He insisted that Chief Justice David Maraga ought to have put into consideration the bigger picture and put into consideration the state of the nation before making such a ruling which he opined will even interfere with the education of the Kenyan learners. Hon. Nyoro could not comprehend how a party with a majority in all the elective posts across the country could be ruled otherwise when it came to the presidential ballot, considering the fact that they were the same voters who voted for the Jubilee candidates. He called on Jubilee Party supporters to get out of their way and ensure all voters within their jurisdiction came out and voted for the president.